Neil_P._Quinn_WMF added a comment to T220456: Many small wikis missing from mediawiki_history dataset. @Neil_P._Quinn_WMF the private wikis are not included on the labs replicas and that is intentional, if you notice we also do not report pageview data for those wikis either. This is at the request of users of those wikis and seems like the right policy as there are wikis of delicate nature there, these wikis will continue not to be included. Neil_P._Quinn_WMF added a comment to T220507: Decide: start_timestamp for mediawiki history. userFirstEditTimestamp - Timestamp of the oldest revision associated to the user (by user_id), whether in revision or archive table. Then in the event-lineage, we'll put the minimum value of those three. Neil_P._Quinn_WMF updated subscribers of T221338: Many revision events in mediawiki_history have missing page and namespace information. @Nuria, @JAllemandou, this is the most significant issue that I identified in T218819 (T218463 is also major, but you've already fixed it 👏). Neil_P._Quinn_WMF closed T218819: Investigate discrepancies in editor metrics between Data Lake and MediaWiki replica pipelines as Resolved. I have now identified pretty much all the discrepancies; they're listed in the description, along with the link to the full notebook of my results. Neil_P._Quinn_WMF closed T218819: Investigate discrepancies in editor metrics between Data Lake and MediaWiki replica pipelines , a subtask of T173853: Calculate movement-wide contributor metrics using the Analytics Data Lake, as Resolved. Neil_P._Quinn_WMF updated the task description for T218819: Investigate discrepancies in editor metrics between Data Lake and MediaWiki replica pipelines . Neil_P._Quinn_WMF added a comment to T188391: Develop strategies and tools for segmenting wikis [2018-19 AP output 4.3]. We have decided that, sadly, we don't have the capacity to finish phases 2 and 3 during this fiscal year (by June), so we have deprioritized them. We would still like to do them someday, so they live on as separate tasks (T221563 and T203033). Neil_P._Quinn_WMF added a subtask for T221566: Update and fix wiki segmentation dataset: T184576: Make an Analytics Data Lake table to provide meta info about wikis . Neil_P._Quinn_WMF added a parent task for T184576: Make an Analytics Data Lake table to provide meta info about wikis : T221566: Update and fix wiki segmentation dataset. Neil_P._Quinn_WMF removed subtasks for T188391: Develop strategies and tools for segmenting wikis [2018-19 AP output 4.3]: T199265: Fix overcounting of active administrators in the wiki segmentation dataset, T199266: Fix incorrect wiki names in wiki segmentation dataset. Neil_P._Quinn_WMF removed a parent task for T199265: Fix overcounting of active administrators in the wiki segmentation dataset: T188391: Develop strategies and tools for segmenting wikis [2018-19 AP output 4.3]. Neil_P._Quinn_WMF removed a parent task for T199266: Fix incorrect wiki names in wiki segmentation dataset: T188391: Develop strategies and tools for segmenting wikis [2018-19 AP output 4.3]. Neil_P._Quinn_WMF renamed T199265: Fix overcounting of active administrators in the wiki segmentation dataset from Investigate overcounting of active administrators in the wiki segmentation dataset to Fix overcounting of active administrators in the wiki segmentation dataset. Neil_P._Quinn_WMF added a subtask for T221566: Update and fix wiki segmentation dataset: T199266: Fix incorrect wiki names in wiki segmentation dataset. Neil_P._Quinn_WMF added a parent task for T199266: Fix incorrect wiki names in wiki segmentation dataset: T221566: Update and fix wiki segmentation dataset. Neil_P._Quinn_WMF added a subtask for T221566: Update and fix wiki segmentation dataset: T199265: Fix overcounting of active administrators in the wiki segmentation dataset. Neil_P._Quinn_WMF added a parent task for T199265: Fix overcounting of active administrators in the wiki segmentation dataset: T221566: Update and fix wiki segmentation dataset. Neil_P._Quinn_WMF triaged T221566: Update and fix wiki segmentation dataset as Normal priority. Neil_P._Quinn_WMF created T221566: Update and fix wiki segmentation dataset. Neil_P._Quinn_WMF updated the task description for T203033: Develop an insightful, data-driven clustering of wikis . Neil_P._Quinn_WMF updated the task description for T188391: Develop strategies and tools for segmenting wikis [2018-19 AP output 4.3]. Neil_P._Quinn_WMF added a comment to T221563: Standardize key dimensions for grouping wikis. This was part of the wiki segmentation output from the 2018-19 annual plan (T188391), but we've decided to deprioritize it for now. Hopefully, we'll be able to take it up again within the next year. Neil_P._Quinn_WMF moved T221563: Standardize key dimensions for grouping wikis from Triage to Unprioritized Projects on the Product-Analytics board. Neil_P._Quinn_WMF created T221563: Standardize key dimensions for grouping wikis. Neil_P._Quinn_WMF awarded T219177: Add user_is_bot_by to MediaWiki history a Love token. Neil_P._Quinn_WMF updated the task description for T221482: Identify imported revisions in mediawiki_history. Neil_P._Quinn_WMF renamed T221482: Identify imported revisions in mediawiki_history from Identify imported revisions in `mediawiki_history` to Identify imported revisions in mediawiki_history. Neil_P._Quinn_WMF moved T221482: Identify imported revisions in mediawiki_history from Triage to Tracking on the Product-Analytics board. Neil_P._Quinn_WMF created T221482: Identify imported revisions in mediawiki_history. Neil_P._Quinn_WMF removed a project from T212172: Provide feature parity between the wiki replicas and the Analytics Data Lake: Contributors-Analysis. Neil_P._Quinn_WMF moved T221435: Implement a consistent strategy for normalizing month lengths in all monthly metrics from Triage to Unprioritized Projects on the Product-Analytics board. Neil_P._Quinn_WMF created T221435: Implement a consistent strategy for normalizing month lengths in all monthly metrics. Neil_P._Quinn_WMF placed T203033: Develop an insightful, data-driven clustering of wikis up for grabs. I've updated this task to reflect the fact that we have decided to deprioritize it. We (sadly) won't be doing it during the current fiscal year, although we do hope to take it up at some point in the future when we have more capacity. Neil_P._Quinn_WMF removed a parent task for T203033: Develop an insightful, data-driven clustering of wikis : T188391: Develop strategies and tools for segmenting wikis [2018-19 AP output 4.3]. Neil_P._Quinn_WMF removed a subtask for T188391: Develop strategies and tools for segmenting wikis [2018-19 AP output 4.3]: T203033: Develop an insightful, data-driven clustering of wikis . Neil_P._Quinn_WMF renamed T203033: Develop an insightful, data-driven clustering of wikis from Construct and personify wiki clusters [segmentation phase 3] to Develop an insightful, data-driven clustering of wikis . Neil_P._Quinn_WMF moved T132833: Consider smoothing and seasonal trend extraction strategies for top-level metrics from Backlog to Unprioritized Projects on the Product-Analytics board. Neil_P._Quinn_WMF added a subtask for T204953: Address data quality issues in the mediawiki_history dataset: T221338: Many revision events in mediawiki_history have missing page and namespace information. Neil_P._Quinn_WMF added a parent task for T221338: Many revision events in mediawiki_history have missing page and namespace information: T204953: Address data quality issues in the mediawiki_history dataset. Neil_P._Quinn_WMF moved T221338: Many revision events in mediawiki_history have missing page and namespace information from Triage to Tracking on the Product-Analytics board. Neil_P._Quinn_WMF created T221338: Many revision events in mediawiki_history have missing page and namespace information. Neil_P._Quinn_WMF added a comment to T211173: "Edit" equivalent of pageviews daily available to use in Turnilo and Superset. Thanks, @mforns! Looks good to me as well. If you're OK then, I will move on with CRs and deploying this version. Neil_P._Quinn_WMF added a comment to T206894: Set up automated email to report completion of mediawiki_history snapshot and Druid loading. Thanks, @JAllemandou! Sounds like a good plan. Neil_P._Quinn_WMF reopened T206894: Set up automated email to report completion of mediawiki_history snapshot and Druid loading as "Open". Neil_P._Quinn_WMF closed T220460: Confirm Section Editing instrumentation + A/B test working as we expect as Resolved. I just checked this out. Since the experiment started, we haven't seen any clear change in the number of mobile visual editor sessions or their completion rate in either the treatment or the control group. The number of mobile VE users in each bucket is very close to even. So, everything looks very sane. Full numbers in this spreadsheet. Neil_P._Quinn_WMF closed T220460: Confirm Section Editing instrumentation + A/B test working as we expect, a subtask of T209955: [EPIC: Focus] Isolate Section Editing , as Resolved. Neil_P._Quinn_WMF moved T220460: Confirm Section Editing instrumentation + A/B test working as we expect from Next Up to Doing on the Product-Analytics board. Neil_P._Quinn_WMF added a comment to T196839: Tapping in the editing area of the mobile visual editor causes the page to scroll up in Firefox for Android. There is still a slight flicker whenever the cursor is placed anwhere past the first page of the document, but it is usually almost unnoticeable. Neil_P._Quinn_WMF changed Due Date from Mon, Apr 15, 7:00 AM to Tue, Apr 16, 1:00 AM on T220460: Confirm Section Editing instrumentation + A/B test working as we expect. Neil_P._Quinn_WMF set Due Date to Mon, Apr 15, 7:00 AM on T220460: Confirm Section Editing instrumentation + A/B test working as we expect. Neil_P._Quinn_WMF moved T220460: Confirm Section Editing instrumentation + A/B test working as we expect from Triage to Next Up on the Product-Analytics board. 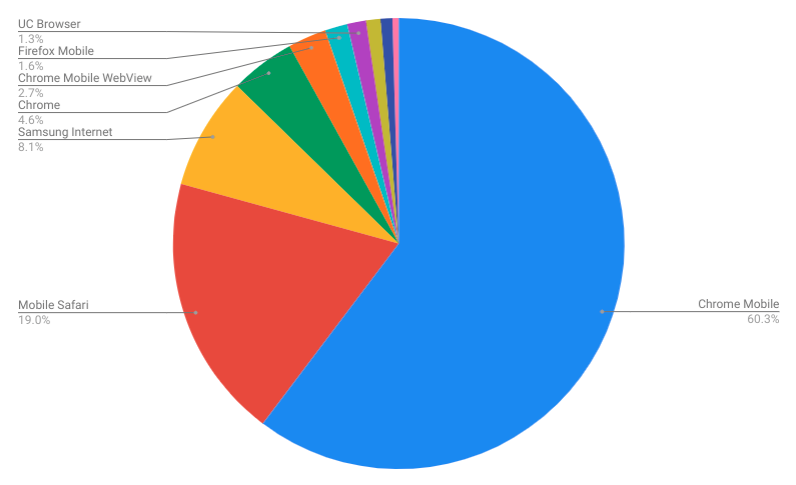 Caveat to user agent breakdown data: as best I can tell, we don't know what browsers, operating systems and devices contributors are using. Although, maybe we can assume FF usage is equally small considering this issue has persisted for >1 year without our noticing/re-engaging with it. Neil_P._Quinn_WMF added a project to T220460: Confirm Section Editing instrumentation + A/B test working as we expect: VisualEditor. Neil_P._Quinn_WMF added a project to T220460: Confirm Section Editing instrumentation + A/B test working as we expect: Product-Analytics. Neil_P._Quinn_WMF moved T220456: Many small wikis missing from mediawiki_history dataset from Triage to Tracking on the Product-Analytics board. Neil_P._Quinn_WMF added a comment to T218851: Instrument mobile visual editor for a section editing experiment. The Section Editing A/B test will run through 14-May-2019. Neil_P._Quinn_WMF added a subtask for T204953: Address data quality issues in the mediawiki_history dataset: T220456: Many small wikis missing from mediawiki_history dataset. Neil_P._Quinn_WMF added a parent task for T220456: Many small wikis missing from mediawiki_history dataset: T204953: Address data quality issues in the mediawiki_history dataset. Neil_P._Quinn_WMF created T220456: Many small wikis missing from mediawiki_history dataset. Neil_P._Quinn_WMF created P8372 Wikis missing from the mediawiki_history dataset. Neil_P._Quinn_WMF merged task T209988: Instrumentation into T218851: Instrument mobile visual editor for a section editing experiment. Neil_P._Quinn_WMF merged T209988: Instrumentation into T218851: Instrument mobile visual editor for a section editing experiment. Neil_P._Quinn_WMF updated subscribers of T220092: Set up edit_hourly data set in Hive. Neil_P._Quinn_WMF added a subtask for T211173: "Edit" equivalent of pageviews daily available to use in Turnilo and Superset: T220092: Set up edit_hourly data set in Hive. Neil_P._Quinn_WMF added a parent task for T220092: Set up edit_hourly data set in Hive: T211173: "Edit" equivalent of pageviews daily available to use in Turnilo and Superset. Neil_P._Quinn_WMF added a comment to T218349: Update translation for "mobile web edit" change tag to "mobile web action". I agree with @Jdlrobson that there's no point rewriting the database just to change the tag from "mobile web edit" to "mobile web action". For such a minor change, updating the display version of the tag (which can differ substantially from the database name: see w:en:Special:Tags for an example) is sufficient. Neil_P._Quinn_WMF closed T171973: Annual Plan 2017-2018, Audiences 3: Increase device support for editing as Resolved. Neil_P._Quinn_WMF closed T171975: Annual Plan 2017-2018, Audiences 4: New editor success as Resolved. Neil_P._Quinn_WMF closed T171977: Annual Plan 2017-2018, Audiences 5: Increase current editor retention and engagement as Resolved. Neil_P._Quinn_WMF closed T171980: Annual Plan 2017-2018, Audiences 5, Goal 1: Recommend where new and tenured users can contribute as Resolved. Neil_P._Quinn_WMF closed T171980: Annual Plan 2017-2018, Audiences 5, Goal 1: Recommend where new and tenured users can contribute, a subtask of T171977: Annual Plan 2017-2018, Audiences 5: Increase current editor retention and engagement, as Resolved. Neil_P._Quinn_WMF closed T171981: Annual Plan 2017-2018, Audiences 5, Goal 2: Give better ways to monitor contributions as Resolved. Neil_P._Quinn_WMF closed T171981: Annual Plan 2017-2018, Audiences 5, Goal 2: Give better ways to monitor contributions, a subtask of T171977: Annual Plan 2017-2018, Audiences 5: Increase current editor retention and engagement, as Resolved. Neil_P._Quinn_WMF closed T171982: Annual Plan 2017-2018, Audiences 5, Goal 3: Provide better workflow and communication experiences as Resolved. Neil_P._Quinn_WMF closed T171982: Annual Plan 2017-2018, Audiences 5, Goal 3: Provide better workflow and communication experiences, a subtask of T171977: Annual Plan 2017-2018, Audiences 5: Increase current editor retention and engagement, as Resolved. Neil_P._Quinn_WMF closed T216883: Document contributors movement metrics as Resolved. Documentation added to mw:Wikimedia Audiences/Data dictionary#Contributors. Neil_P._Quinn_WMF closed T216883: Document contributors movement metrics, a subtask of T215976: Data Dictionary for Core Metrics, as Resolved. Neil_P._Quinn_WMF closed T219019: Add a bucket field to Schema:EditAttemptStep as Resolved. The bucket field is now whitelisted, so I think this is done! Neil_P._Quinn_WMF closed T219019: Add a bucket field to Schema:EditAttemptStep, a subtask of T219018: Support bucketing in VE analytics, as Resolved. Neil_P._Quinn_WMF closed T219016: Add a bucket field to Schema:VisualEditorFeatureUse as Declined. We actually don't need this since VisualEditorFeatureUse relies on EditAttemptStep for all the session-related data. Neil_P._Quinn_WMF closed T219016: Add a bucket field to Schema:VisualEditorFeatureUse, a subtask of T219018: Support bucketing in VE analytics, as Declined. Neil_P._Quinn_WMF closed T214533: Mobile visual editor not logging EditAttemptStep abort actions as Resolved. Neil_P._Quinn_WMF added a comment to T212529: Standardize datetimes/timestamps in the Data Lake. @Ottomata, @JAllemandou it sounds like the long-term vision you have is using ISO strings for EventLogging and similar data streams and Unix timestamps for "Hive-native" datasets like mediawiki_history. Neil_P._Quinn_WMF renamed T219542: Make data access guidelines public from Make data analysis guidelines public to Make data access guidelines public. Neil_P._Quinn_WMF moved T219542: Make data access guidelines public from Triage to Backlog on the Product-Analytics board. Neil_P._Quinn_WMF triaged T219542: Make data access guidelines public as Normal priority. Neil_P._Quinn_WMF moved T217787: Create a dedicated page for information about the Analytics MediaWiki replicas from Triage to Backlog on the Product-Analytics board. Neil_P._Quinn_WMF triaged T217787: Create a dedicated page for information about the Analytics MediaWiki replicas as Low priority. Neil_P._Quinn_WMF updated subscribers of T219542: Make data access guidelines public. I have no problem myself on making those guidelines public, if you want to move the document to wikitech please do so. Now, they really give the wrong impression that anyone can file a ticket and get access to this data (this is a regular request) while that is not the case.